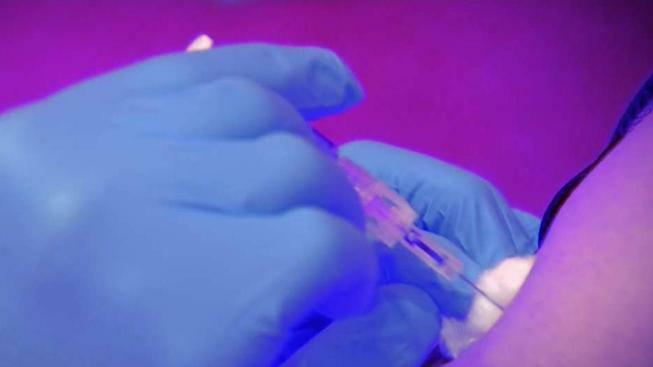 Patients who lose the use of an arm after a shot is given incorrectly can receive a settlement from a federal program, but the News4 I-Team learned that program doesn’t tell the person who gave the shot about the mistake. "How are you going to solve somebody getting a bad flu shot if you don't inform them that they did it wrong?" said Bonnie Gamberdella, who still can't raise her arm all the way after getting a flu shot in 2015. Gamberdella struggles to do basic chores like cooking and styling her hair. "It's indescribable the pain that you have," she said. "You can't sleep with it, you can't move it around. You want to you try to, but it just hurts so bad, you can't do it." Her condition — shoulder injury related to vaccine administration (SIRVA) — is on the rise. It can happen to anyone, anywhere shots are given: a drug store, a workplace, even a doctor's office. "It's because they put the injection in the wrong spot of my arm," said Gamberdella. She filed a claim with the Vaccine Injury Compensation Program, a $3.7 billion federal fund created to take care of victims with catastrophic reactions. About 6,000 patients have received nearly $4 billion so far. The News4 I-Team found more than $76 million of that has been for shoulder injuries like Gamberdella's. In May, the News4 I-Team exposed that half of all the new claims filed in the program last year were SIRVA, which can be prevented by using proper injection techniques. But even if a shot-giver injures multiple patients, the federal agency that runs the program never alerts the shot-giver to get retrained. "It happens more than you would expect," said attorney Paul Brazil, whose law firm specializes in vaccine court cases. He said two-thirds of his entire practice is now SIRVA cases. "It can go wrong a lot of ways, and that's part of the challenge," said Brazil. He said it usually happens when a shot is given too high on the arm or if the needle is too long for a small-framed patient. He's even seen a husband and wife who got the shot together both get injured. In several cases, multiple coworkers who got flu shots at their office all developed SIRVA. "When you've seen more than one person suffered injury on the same day from the same person, yeah, that would indicate that it was probably an improper technique," said Brazil. The I-Team discovered no one keeps data on how often SIRVA happens, where it's happening, or even which shot-givers caused the injuries. "The vaccine administrators are isolated from this. They're not a party to it," said Brazil. The vaccine court is a no-fault, no-blame system which protects vaccine makers and those who give shots from being sued. And they don't even have to pay for the program, you do — with a 75-cent tax on every shot you get. "You know if they were the ones being sued, they would be very cognizant of the fact that they may have caused a serious shoulder injury," said Brazil. "They don't hear about it. So how would they know that they did something wrong?" The Health Resources and Services Administration declined the I-Team's request for an interview but sent a statement citing a "confidentiality provision" which the agency says "prevents the release of information submitted in a Vaccine Injury Compensation Program proceeding to someone who is not a party to the proceeding, absent express written consent." But in every case, the patient already consents to contacting the shot-givers, Brazil said. "You notify the place that administered the vaccine because you have to get the records, so they know something is going on," he said, adding that it shouldn't be that hard for the government to also alert them that it’s SIRVA and request retraining. Even a form letter that doesn't identify the patient's name would be helpful, Brazil said. Or if all shot-givers could retrain on the proper technique every year, he said that would also help in cases where the records only show where the shot was given, not who actually gave it. "Just doing that could go a long way," said Brazil. "I think most people, if they were made aware of it, they would want to improve." Gamberdella said her shoulder will never get better, and while she appreciates the settlement that's coming, she hopes the program will evolve to help prevent SIRVA, instead of just continuing to pay claims. "It's very hard to have to live with something that you know is never going to get better," she said.